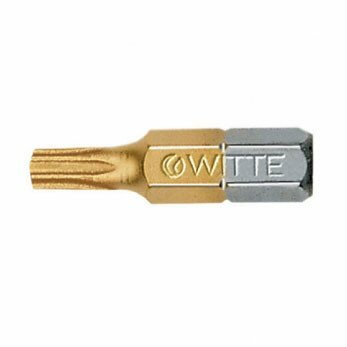 HIGH RELIABLE QUALITY BITS FOR USE IN INDUSTRIAL DREW DRIVING APPLICATIONWITTE 's Industrial bit programme is convincing due to the broad and in depth range of products, as well as their equally high quality based on state of the art manufacturing methods. In order to assure the high demands of industry and crafts a complex hardening process guarantees a permanent hardness in the range of 59-61 HRC. As a matter of principle WITTE Industrial bits are made from only high quality materials and obtain high torque values far in excess of the DIN norm, whilst at the same time achieving an extremely long working life.